One of Deb's famous Belly Bears, this Belly Bear Dentist is certainly ready for any personalization that you may want to ad. 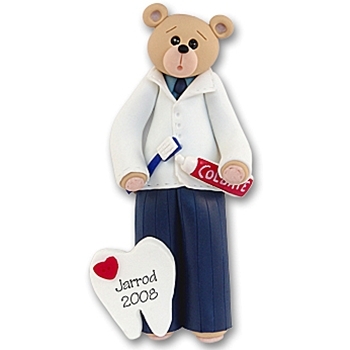 He may be personalized on the giant tooth with the Dentist's name, practice, year etc. He is handmade and wonderfully crafted from polymer clay. Comes complete with hook and satin ribbon for hanging. Measures approximately 3½" x 2½"